Sliding windows, often referred to as sliders, are very popular among homeowners who appreciate a clear view of the outdoors. 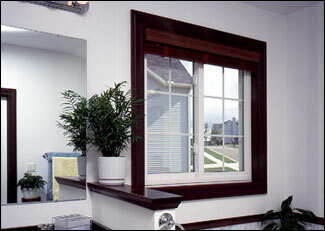 These are highly energy-efficient windows and are available in a variety of styles and colors to choose from. As with the rest of our line of Remodel America windows, they are maintenance free with a lifetime warranty. Wide variety of designer glass and color options to match any architectural motif. Sculpted glazing bead offers the authentic look of wood. Two heavy-duty sash cam locks on windows over 26" high for added security. Ventilation limit locks add security while windows are partially open. Extra thick weatherstripping, R-core insulation and full interlock provide high thermal performance. Full 7/8" Intercept™ warm-edge insulated glass is standard on most products and provides higher R-factors and stronger insulated glass units. Our Hi R+Plus® multi-layer vacuum-deposition soft-coat Low-E glass series allows you to choose from among the best insulating glass systems available. Sashes are removable from inside the home to allow easy cleaning. Maintenance-free uiPVC inside and out...never requires caulking or painting and is virtually maintenance free. Optional Easy-Clean™ Glass needs cleaning half as often and with half the effort of ordinary window glass. Fusion-welded sash and frames provide maximum strength. They're guaranteed to never work loose or separate. Heavy-duty track and roller system for long life and easy gliding. Heavy duty hardware is guaranteed for life. UniFrame European In-Swing Sliding Windows feature state-of-the-art operating hardware that allows you to either glide or swing them open. In-swinging sashes provide large, unobstructed views and maximum ventilation. Friction locks prevent unwanted sash movement. In-swing operation allows easy glass cleaning.